Lisa Baker loves baking. She also loves dogs. Fortunately for our four-legged friends, Lisa combined her loves to make The Blind Dog Biscuit Company. These treats are a wholesome and healthy addition to your furry friend’s diet. Now, Lisa can share the love she has for dogs, baking and the community around her. 1. Where is your favorite place to take your dog in Birmingham? Anywhere! Birmingham is such a dog-friendly community. It’s fun to take them to the Market at Pepper Place, dog parks, Moss Rock preserve and anywhere else that welcomes four-legged friends. 2. Why did you choose dog treats as your main product? Blind Dog Biscuit started from a request from a friend of mine, Dr. Sandy Cross. She asked me to make dog biscuits for the grand opening of Paws n Claws Bed and Biscuit in Odenville. Since I already loved to bake, it wasn’t a stretch to find some dog-friendly recipes. Afterwards, her customers started asking for the treats. 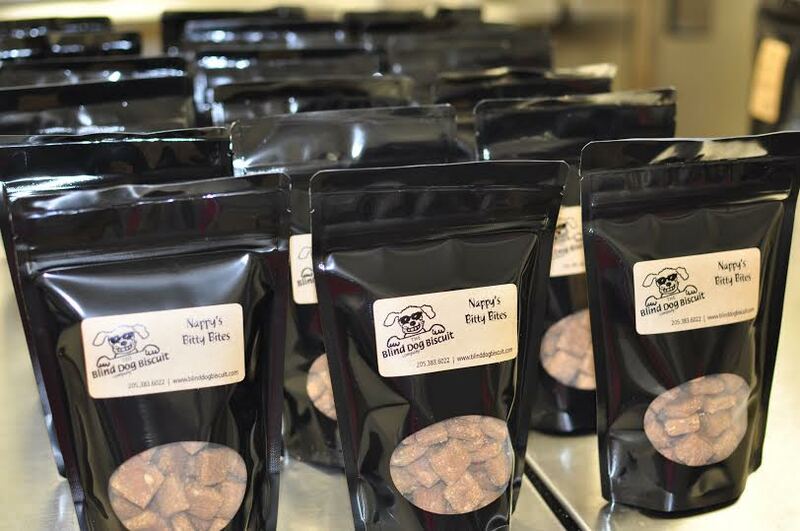 The Blind Dog Biscuit Company was founded in 2007. The Company is named for Tinker, one of our beagles who went blind. She may not have been able to see but she could always find a biscuit! 3.What treat is a must-try for every furry friend? That’s a hard one. The peanut butter Bitty Bites are a classic. However, our newer BeeHam biscuit (Country Ham and Honey) is coming up as a new favorite. All of our biscuits use organic ingredients whenever possible. The goal was never to make a fancy biscuit, just a healthy, wholesome treat that people can feel good about feeding their dogs. 4.Why is Birmingham the perfect place for your product? It has been a lot of fun to see the dog community in Birmingham really blossom over the last few years. Now, there are so many great dog-friendly events and places that welcome dogs. Plus, Birmingham is becoming a place where people are interested in buying local and supporting local businesses. That’s a great combination.